Grizzly Bear Face Blanket Tapestry Throw at Animal World® is perfect for home decor or keeping warm on a chilly day. Made in the USA of 3 ply 100% cotton this Grizzly Bear Throw Blanket measures 70"L x 54". 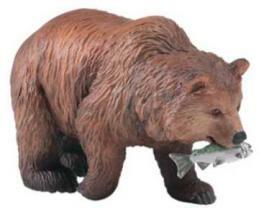 Shop our Grizzly Bear Gifts Store at Animal World® page for additional Grizzly Bear gift items.